"Between history and legend." 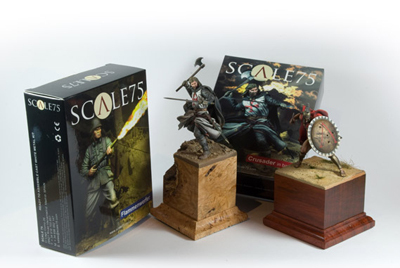 SCALE 75 is the reflection of a particular philosophy in the world of modelling. A different image, a new concept in presenting figures with a clear aim to be a benchmark in both the national and international markets. It has become a part of the SCALE75 world where you can enjoy the great personalities, heroes, myths, legends, villains and warriors throughout history, created from the most revolutionary artistic concepts of modelling. Character, movement, detail, strength and epic are the distinguishing features of all our creations. We work with the best professionals and renowned artists in the world of modelling to give life to our characters. All our products are part of a careful process of creation, from the very conception of the idea, then reviewed by the best historians, modellers and painters to the quality and finish of the miniatures. Only in this way all of our characters will form a prominent part of your showcase. Delve into the different eras with our collections, discovering in them the highest-quality figures made of white metal at a 75mm scale and limited series. All ready to be assembled and painted by you.